I'm a member of the etsy paper twirlies team, every month we've been trying to have a contest where we submit something we've created based on the theme; this month's theme is Valentine's Day - which I just love. I've been trying to figure out what I wanted to do and I usually try to do something different, so I looked through all my stuff and found a wood photo block I bought in November or so. It was for Christmas, it had outlines to paint in on each side of a small Christmas scene, I knew I wasn't going to keep those so I just painted over all that. 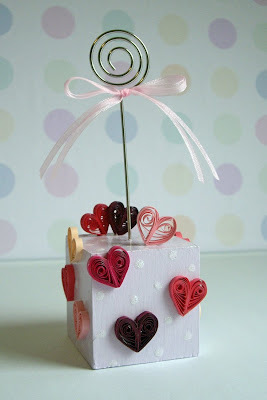 I quilled a bunch of hearts in pink/red colors and glued them all around the cube. I then took the same lavendar color, added a little white and painted dots all over it; to make it shiny I painted over the block area's with watered down Modge Podge. Once dried, I used clear/white glitter glue and put that over the lightened color dots. Added a doubled pink organza bow and voila - my january entry. I love the colors and the simplicity of the whole thing, may keep this one for myself. I only bought one photo block from Michael's and now I'm wishing I had bought more. I'm going to get on the internet and see where I can buy more, I really like the way it turned out and think they are a good idea for both shops and any craft fairs I do this year - if I do any. That is just beautiful. I think you should keep it for yourself. We all deserve a reward for our hard work sometime! What a great idea..I love it!